I’m sure some of you guys were part of this year’s Game Jam. Yes, we have one in Macedonia as well; in two cities, Skopje and Bitola, and for two years already. Last year we missed it, so we had to be part of this year’s event. As one of the few game dev. studios in Macedonia we had to do something more, aside from participating in the event. Finally we settled with the organizers in Skopje on being mentors during the event and hold a panel about what we experienced so far in the game dev. industry. The panel turned out to be a great hit, because everybody wanted to know how it is to work in game dev. company. Nobody knew what to expect from the event and from the participants, so we kept our expectations to a minimum. 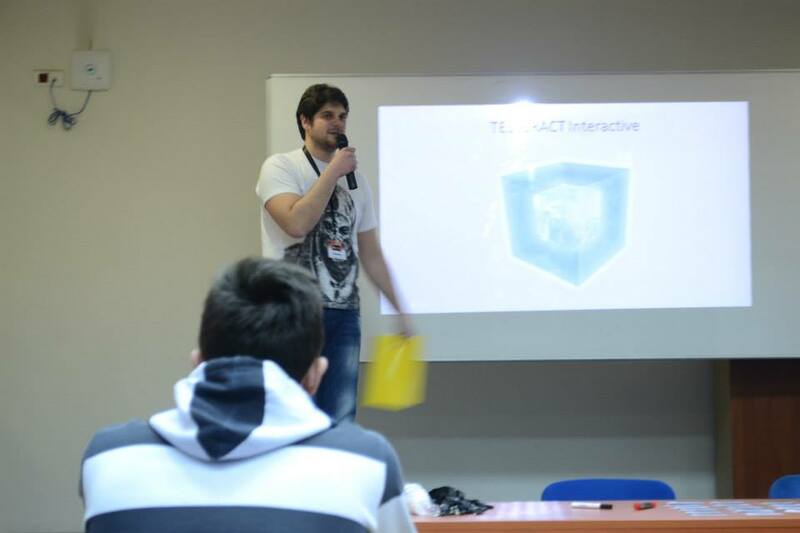 The event took off with presentations from a couple of companies, among which Tesseract Interactive. It was quite surprising that most of the people there already knew about Excubitor and were happy to give us their feedback and ideas. The 48 hour journey began with the announcement of this year’s Game Jam theme: “We don’t see things as they are, we see them as we are”. After the theme announcement most the people pitched their ideas and formed teams. As promised, we started lending a hand to the guys that needed help setting up their projects, design advice etc. This carried on throughout the whole event. It was very fulfilling to see how the ideas were becoming reality in such a short amount of time. Most of the teams were beginners, but a few of them showed signs of real game dev. talent. If you want to check out the games that were developed in Skopje click here, and in Bitola click here. Some of them are really good. One of our team members joined team which was voted the game which captured the Game Jam theme the most. The game is called Ben, after Ben Underwood, who is a kid from the USA who uses sounds to see the world. To check out the game click here, it’s a real trip. This was a great experience for the whole team. It is a relief for us to know that we are not alone in Macedonia, and inspired us to work even harder on Excubitor.